Former FBI director James Comey at Monday morning's talk in the Ringling College Library Association Town Hall series. 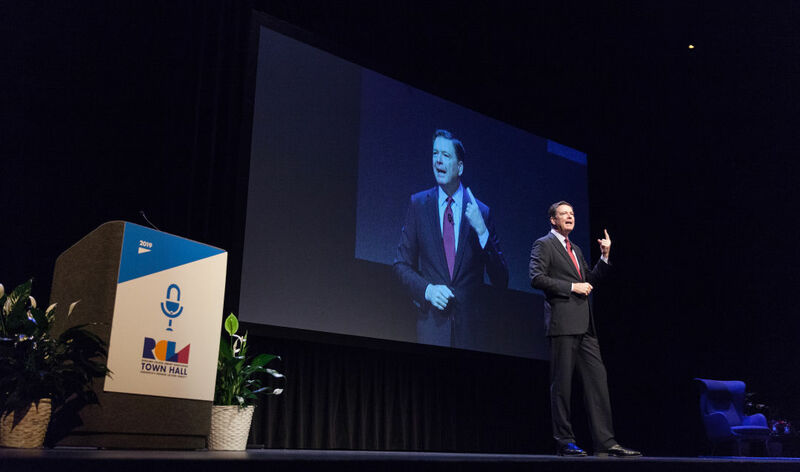 Former FBI director James Comey received a standing ovation from at least some members of the audience when he spoke Monday morning as part of the Ringling College Library Association Town Hall series at Van Wezel Performing Arts Hall. That must have felt good to Comey, who was unceremoniously fired by President Donald Trump back in May 2017. 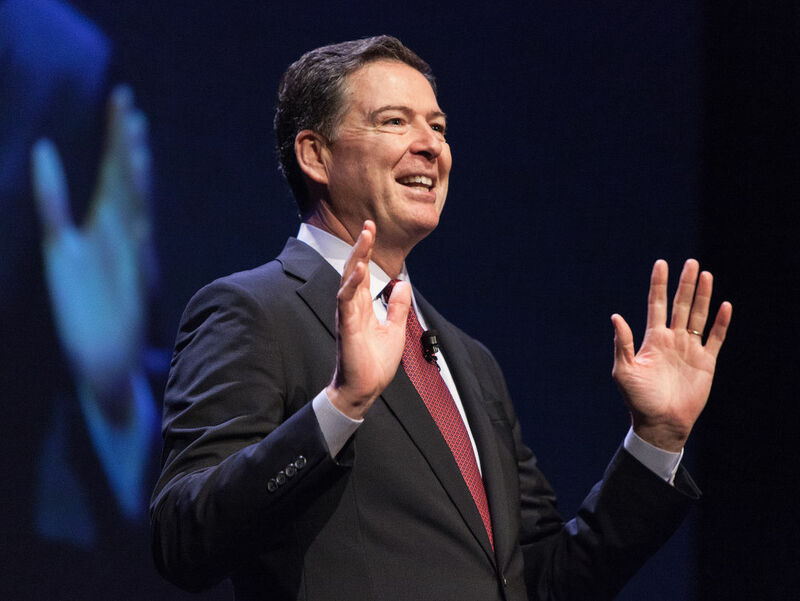 Comey, who has also served as a federal prosecutor, U.S. attorney and U.S. deputy attorney general under President George W. Bush, addressed that firing in his talk—often with surprising humor—as he has done in his book, A Higher Loyalty: Truth, Lies and Leadership. Comey frequently used humor in his speech, which touched on truth, lies, politics and his height. Comey, who was appointed FBI director by President Barack Obama, said he aimed to keep the FBI nonpolitical, so that truth remains the touchstone of our country’s common values. Working under Presidents George W. Bush, Obama and Trump, he pointed out that lies have been told by all—in the case of Bush, regarding “weapons of mass destruction” leading to the war with Iraq, in the case of Obama, when promising that “if you like your doctor, you can keep your doctor,” regarding his health care plan. But he also praised Obama as the “best listener” he knew. “He never sat behind a desk at a meeting, he turned and faced you. He could be quiet for 10 minutes and he wasn’t thinking about golf, because then he could ask questions” about what he’d heard. About that famous firing: Comey was meeting with FBI employees in Los Angeles that day in a large room where, at the back, there were three television sets. “You see where this is going?” he asked his audience. “I look up to see on the screens ‘Comey Resigns.’ Well, the FBI, they’re hilarious pranksters, so I thought it was a scam. Then I looked up again and saw ‘Comey Fired.’ I said to everyone, ‘I don’t know whether it’s true or not, but I am going to find out.’” After calling his assistant back in Washington, he was told that someone was knocking at the FBI’s door with a letter making the news official. “So I thought, how do I get home?” he joked. “I came on an FBI plane, but I’m not with the FBI anymore. And someone said to me, ‘Don’t worry, we’ll get you home on that plane if we have to take you in handcuffs.’” He didn’t need handcuffs, fortunately, but once aboard, he admitted, he did open a bottle of wine and drink some from a paper cup. Remaining in the 2019 Town Hall series season are speakers Jimmy Wales, Caroline Kennedy and Ian Bremmer. Limited single tickets are available at rclassociation.org.